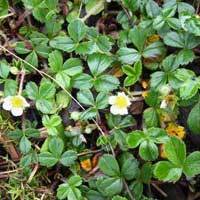 Attractive white flowers, and small strawberry fruits. Aggressive spreader. Drought tolerant with attractive flowers. Grows great across woody mulches.